You’ve missed me, haven’t you?? Mama’s busy now that The Kid’s home, so once again, I’m commandeering her blog. Because today is special. Can you guess why?? No, it’s not because Mama’s alma mater Ole Miss is playing the Egg Bowl at rival Mississippi State (though that’s kind of a big deal around here). No, it’s not because The Kid’s alma mater Notre Dame is playing rival Stanford (another big deal, involving yelling at the TV and those striped ref guys). And it’s not because there are only 33 days remaining in 2015. Nor is it because only two days after the turkey feast, folks are exchanging leftover bird for pizza. Today’s special because it’s my birthday! Now, Mama would be only too happy to share how old (young) I am with you, but I’m writing this post, and when dogs get to “that certain age,” we prefer keeping our secrets! So don’t mind me (yawn). I’ll just go back to my nap and await the leftovers. The rest of you are encouraged to party hearty in my honor. And eat lots of cookies! This entry was posted in Dogs and tagged birthday, college football, Dallas, leftovers, rival Saturday. Bookmark the permalink. I don’t know how old you are, but from the photos that Mama has posted, you still look like a little puppy! 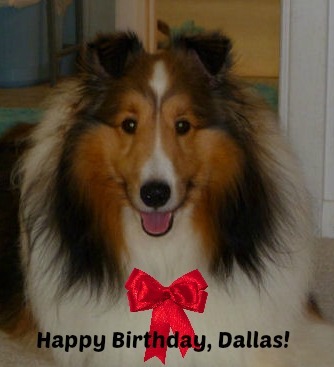 Have a terrific birthday, Dallas! And please tell Mama I said Hi! Why, thank you, Mr. Ron — I’m having a lovely birthday. No cake, but I did get a speck of pumpkin pie and some hamburger, and I’ve got my paws crossed for a spot of turkey for dinner!! Mama sends her love and hopes you’re have a wonderful holiday, too! Happy Birthday, Dallas! We think you look splendid for your age, whatever it might be! We have discovered the secret of eternal youth – 22 hours sleep a day, regular tummy tickles and plenty of good food on demand. We’d give you a few more tips, but we really need a nap now… have a great day! Aw, Tommy and Tuppence, y’all know the secret of happy living!! Birthdays aren’t all they’re cracked up to be — unless you count the treats, both food and extra hugs!! Nevertheless, I’m letting Mama and The Kid love on me all they want because we only have one birthday a year, right?! Thanks for dropping by Mama’s corner of the world! Happy birthday, Dallas :) how fun to have another celebration besides turkey day. Happy Birthday. Dallas. Many treats are due you. Thanks so much, Mr. John. I can tell you’re someone who knows how to treat doggins — “many treats” sounds just perfect!! Gee, thanks, Dixie Rose! I’m not at all sure what cats find interesting or entertaining about catnip (is it food? because then, you know, I’m all in!!) So thanks for sharing and for the birthday wishes. We’d probably get along famously in person…well, maybe not, as I love to chase kitties, heehee! Dallas, my man, have a great birthday! But I bet you already did. I’m a bit late, see. No problem, Professor — I’m still celebrating! Besides, dogs can’t tell time, you know, so if Mama didn’t make a Big Deal out of a certain day, I’d never know it was my birthday! Same here! I hope you got some goodies. Or treats. Dallas, I hope you had a super duper, extra special birthday celebration! Hope it was amazing!